If only in the interest of completeness, I am including Shinbone Alley in this survey, tho I have managed to avoid it on every level for all these many years--one of the very few. Somehow I could never get enthused about a love story between a cockroach and a kitty. The idea of such a musical was abhorrent to me long before Cats. 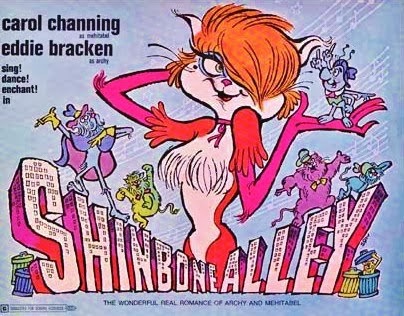 Surely the biggest flop tuner to become a movie, this is a curious property that began as a spoken-word record of a popular old series, Archy & Mehitabel, voiced by Eddie Bracken and Carol Channing, with some original songs by Joe Darion & George Kleinsinger. Released in 1955, it inspired a full-scale Bway musical two years later; with the addition of a still unknown Mel Brooks to assist Darion on the book. Eddie Bracken (whose years as a Preston Sturges hero were behind him) was again Archy, and Eartha Kitt (still looking for a follow up to New Faces) replaced Channing's Mehitabel. (Presumably, Carol was asked but declined.) Even with scant new musical competition in the Spring of '57 the show lasted just six weeks. It's not hard to see why. Actors portraying animals are easily tiresome; anthropomorphic creatures are better served in cartoons--as Disney had long ago proven. So it wasn't an entirely irrational choice to resuscitate Shinbone as an animated feature, tho it could only be justified as a labor of love. For the Bway source wasn't a sterling piece of work to begin with. Archy & Mehitabel was a series of stories by newspaper columnist, Don Marquis written during the 1910s & '20s concerning a former poet reincarnated as a cockroach (after Kafka's Metamorphosis, published in 1915), who bangs out an anonymous column in a press office by jumping on typewriter keys. His tales concern the inhabitants of Shinbone Alley including the randy alleycat, Mehitabel (who fancies herself the former Cleopatra). This inter-species relationship, as problematic as it is improbable, became something of a minor literary classic. Tho not, I suspect, one likely to endure in the 21st Century. Who did they think the market was for this material back in '71? Animated movies were still very much geared to kids, with parents mostly an after-thought, but this wasn't very engaging or appropriate material for children. Nor was it creative or clever enuf to entertain adults. (The ad copy ran: "Sophisticated enough for kids, simple enough for adults"--it was neither.) Whatsmore, animation during this period was in decline. Features were few and far between--and mainly ignored. The early Disney years were far behind, and a new, harsher-lined style was much in vogue. Ralph Bashki (the pioneer of adult cartoons) aside, it would take another 20 years for animation to evolve and regain some prestige. That said, there was more variety and interest in the design of Shinbone Alley than I expected, tho an equal amount was barely passable. But in comparison with classic Disney or today's Pixar, the look of this cartoon is piss poor. As far as a story goes, Mehitabel is an easy "romantic" (or a cat in heat) who runs off at the drop of a hat, and inevitably returns rejected. That she periodically attacks her only ally, Archy, doesn't make her any more sympathetic. There are strange echoes of Porgy & Bess, with Shinbone Alley serving as a feline Catfish Row. On Bway, the show--much like a certain Lloyd-Webber opus--relied heavily on dance, with some lenghty ballets. People playing animals are only evocative thru a lens of abstraction. Cartoons can dispense with all that--a cat is a cat. Stripped of ballets, the musical on screen clocks in at 84 minutes. Kleinsinger's score doesn't rise above the level of a children's television show. (It could be from "The Mr. Bungee Show" in William Finn's A New Brain). Even the show's most cited tune, "Flotsam & Jetsam" is barely there as a song. Bway wouldn't seek his services again. General consensus says Carol Channing was too "large" for the screen. But the same is almost true for the stage. After her initial splash in a revue, Lend an Ear, which quickly led to Lorelei Lee (where her comic voice found perfect expression), Carol had a long struggle finding another show to suit her personality. She languished thru most of the '50s: a flop here (The Vamp), a less than victorious replacement there (Wonderful Town); resorting to a nightclub act (Show Girl). But after '64 she was now and forever Dolly Levi, and recognized almost as much for her unique (and easily mimicked) voice as for her second balcony smile and towering cream puff personality. But deprived of the latter, one is inclined to be much less enchanted listening to her basso profundo tones, and screechy high notes for an hour and half as a nasty pussycat. She's shrillest when screaming or yelling--which she does often--or reciting Shakespeare to a jazz beat; it's a horribly mannered performance. Which, come to think of it, could be said as well of her Oscar nominated Muzzy Van Hossmere in Thoroughly Modern Millie. Like oysters (or "raspberries") Channing is an acquired taste. CBS didn't acquire it in '66, when she made a sitcom pilot written by I Love Lucy's writers Bob Carroll Jr. & Madelyn Davis, as a 40-something That Girl--a yokel trying to break into show-biz. It's available as a bonus on The Mothers-in-Law sitcom DVD set. Just a few weeks before Shinbone's release Carol returned to Bway in a comedy, her first new stage role(s) since Dolly. Four on a Garden was a quartet of playlets adapted by Abe Burrows (from the same French authors who helped him to Cactus Flower). Her co-stars were Sid Caesar, George S. Irving, and as utility, Tom(my) Lee Jones in his brief, early stage years. The play eked out a three month run. Theater, like the film industry was very much in flux. The catchword from Bway in the Spring of '71 was "Nostalgia." A term both Time and Newsweek were coining in their cover stories on the confluence of a smash revival of the 1925 No, No, Nanette with the spanking new Sondheim & Prince Follies--trafficking in old-time show biz with a modern viewpoint. A third musical featuring a fully veteran cast, the new Kander & Ebb show, 70, Girls, 70, was a quick casualty--lost in the shadow of the others. The Tony Awards, which were held absurdly early on March 28th (before either Follies or 70 Girls opened), were still catching up to last year's Company; the night's big winner--tho Elaine Stritch would lose to Helen Gallagher (not undeserving) for her fancy footwork in Nanette--something of a redemption two decades after Hazel Flagg (see Living It Up). Stritch would have to wait decades more to score her own Tony. Carol Channing coasted on her signature shows thru the decades forward; all the more astonishing she would find herself classed among the Queens of Bway on the basis of just two roles--which Hlwd gave to Marilyn Monroe and Barbra Streisand. Ironic then, that her one Bway musical film was a show she declined to do on stage, tho she was part of its genesis. I too was coasting that spring of '71, slogging thru boring business classes at DeAnza Junior College; hanging out with my one friend, Bill; stocking my film education with late night, commericial-laden, B&W TV broadcasts of vintage Mae West and Marx Bros. movies, seeing for the first time such classics as Double Indemnity and Vertigo. But I was living for that day come June when I'd step back on a 747 and spend my summer in New York. Little did I know what impact this second visit would have on my return to California.